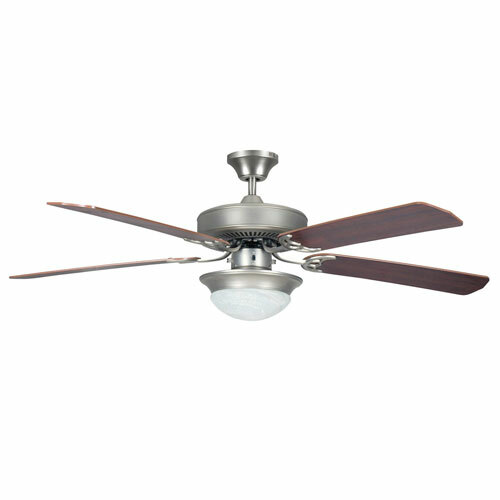 Concord Fans 52" Heritage Fusion Satin Nickel Modern Ceiling Fan with Light Kit Contemporary Ceiling Fan with Bowl Light Kit 52 inch Decorative High End Ceiling Fan and Lights 52HEF5SN Roosevelt Collection Ceiling Fan All items are 100% NEW, never before used, and sold in their original packaging. - Easy to Install - Installation Instructions Included - COMPLETE ITEM: Everything necessary for installation is included! - Height: 17" - Downrod extensions available for high ceilings if necessary - Width: 52" - Voltage: 120V - Ceiling Fan with Light Kit Included - Number of Light Bulbs: 2 - Type of Light Bulbs: Fluorescent - Max Wattage: 26 - Type of Bulbs: 13W E-26 CFL (Included) - This fan cannot be flush mounted. - Number of Fan Blades: 5 - Reversible Fan Blades Black Forest/Rosewood - Blade Pitch/Angle: 12 Degrees - Safety Rating: UL / CUL - 4.5" Downrod Included. - Noise Free Speed Control Method - Concord Fans use precisely manufactured triple capacitors with Underwriters Laboratory (UL) tested and approved quality to ensure and guarantee all fans will NOT hum or buzz. Imagine running your bedroom ceiling fan at night with no noise. Or what about your living room or kitchen fan noiselessly keeping everyone cool during a party! - 3 Speed and Reversible - All Concord Fans come equipped with 3 speeds: high, medium, and low. All fans are reversible to provide recirculation of warm air trapped at the ceiling level during winter. This fan cannot be flush mounted. 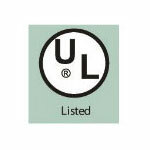 Noise Free Speed Control Method - Concord Fans use precisely manufactured triple capacitors with Underwriters Laboratory (UL) tested and approved quality to ensure and guarantee all fans will NOT hum or buzz. Imagine running your bedroom ceiling fan at night with no noise. Or what about your living room or kitchen fan noiselessly keeping everyone cool during a party! 3 Speed and Reversible - All Concord Fans come equipped with 3 speeds: high, medium, and low. All fans are reversible to provide recirculation of warm air trapped at the ceiling level during winter. Because of high-quality quiet motors and modern designs, Concord has become one of the fastest growing Ceiling Fan brands in the industry. Attention to detail is what sets Concord apart. Their products are solid, heavy-duty, and also very beautiful. Offering many contemporary styles a Concord Fan is sure to dazzle all your guests. And by the way, they do an amazing job keeping you cool! Great for reducing your energy bills in summer and your heating bills in winter, a Concord fan is the perfect addition to any home. Join the trend and find out what everyone is so excited about! Get yours today! 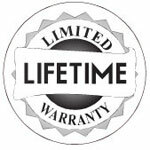 Faucetlist.com is an authorized Concord Ceiling Fans distributor so this fixture includes the comprehensive Lifetime Warranty against all defects. Concord manufacturers high-end products that are built to last. 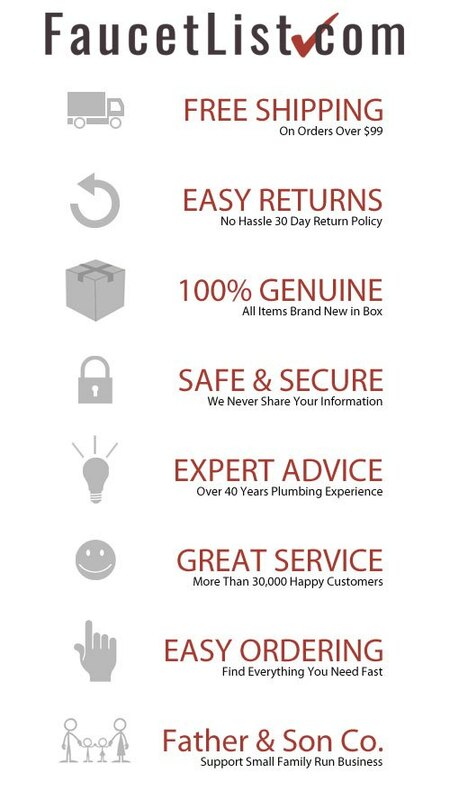 With a continued commitment to excellence, Concord Ceiling Fans are swiftly becoming an industry leader.